The present volume of The Permanent Court of Arbitration/Peace Palace Papers series reproduces the papers presented at the Second International Law Seminar, held on May 17, 2000. Inspired by the convergence of two recent developments; a rapid growth in direct foreign investment, and a sharp increase in environmental consciousness; this seminar addressed a topic of compelling interest to both practitioners and students of international law: the role of dispute resolution mechanisms in the field of international investment and protection of the environment. In this publication, prominent experts examine the inherent conflicts between the norms that underpin both areas. This relatively unexplored field of international law is likely to become a permanent and expanding feature of the international agenda, as well as a challenge to national and international courts and tribunals. 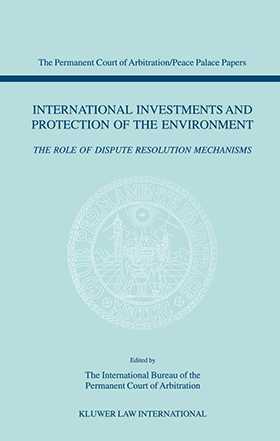 This volume also includes an analytical French language summary of the seminar papers, an elaborate set of guidelines for negotiating and drafting dispute settlement clauses for international environmental agreements, and an article examining the arguments for and against the establishment of an international court for the environment.